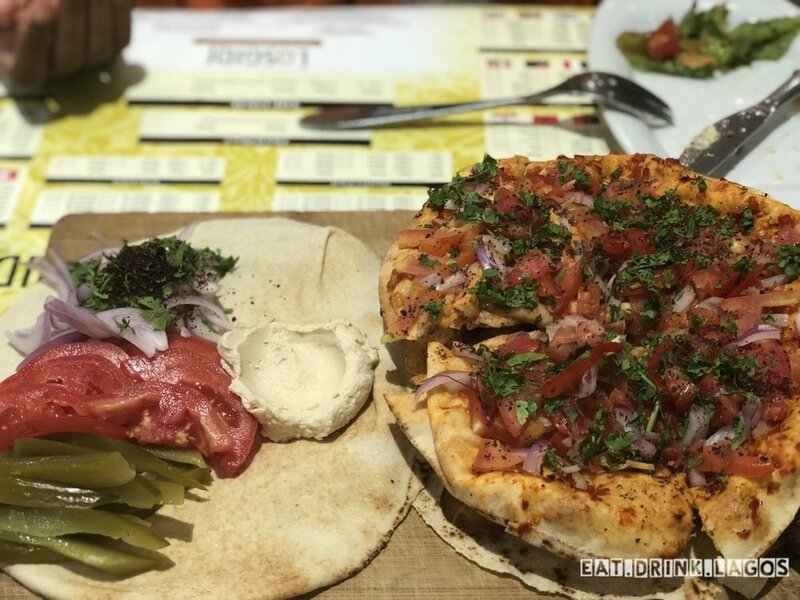 Does Las Gidi Express Sound Like a Lebanese Restaurant? NOSA: I stumbled on Las Gidi Express while grocery shopping at Goodies, I mean Winners the other day. Sidenote: Winners has quality meat if you’re into that kind of thing. FOLLY: It's 2018 and Nosa is still trying to get me to go to all these "restaurants" that I don't want to go to. NOSA: Anyway, Las Gidi Express is still very new as far as Lagos restaurants go. By “new”, I mean some chairs are still unwrapped. FOLLY: I mean, that's why I didn't want to go. I wasn't even sure that it was a real restaurant. NOSA: Or maybe those are fresh imports. Either way, it feels like a place that’s still finding its feet. Perhaps it’s not too late to change name. FOLLY: Oh yes, it definitely struck both us of as odd that a Lebanese restaurant would be called Las Gidi Express. A Nigerian fast food yes? but a typical Nigerian-Lebanese restaurant with a paper brochure menu, nope. NOSA: To start, we ordered the Special Hummus. Hummus is our typical go-to at Lebanese owned spots. That’s usually how I gauge if they sabi the work or not. Unfortunately, the hummus was a bit meh. It was decent enough, but not great. A bit lazy perhaps. FOLLY: It seemed like the cook felt the key to good hummus was just lots of olive oil and chickpeas. The beef wasn't browned as much and so the flavour didn't quite develop, the hummus was also desperately in need of a dash of salt. NOSA: A bit of a random aside, isn’t it great how family friendly Persian food is? All the plates are designed with sharing in mind. Or am I making this up in my head. NOSA: Next, we got some Manakish. Half zataar and half cheese. And it smelt soooooo good. 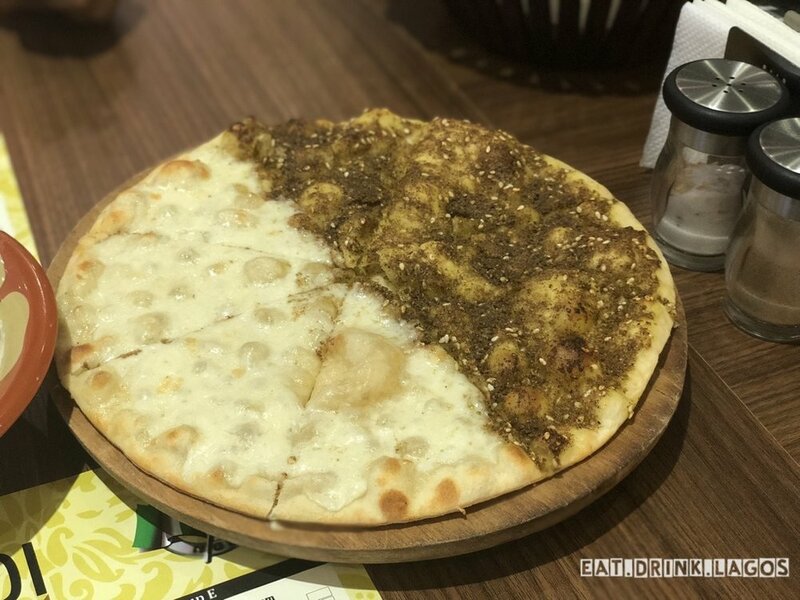 Makanish is like a Middle Eastern pizza and in Levant countries, it’s actually a breakfast staple. Pizza for breakfast sounds like something i did as a broke college student. Maybe pizza is an Italian manakish, who knows? FOLLY: Za'atar manakish is one of my favorite things about Middle Eastern food. The za'atar spices are a combination of thyme, oregano, sumac, and sesame seeds give or take. In Lagos, you'd be hard pressed to find a Lebanese restaurant serve you something with dodgy cheese. This is because of the excellent supply chain management they exhibit by either owning the supermarket or having a friend or family member that does. NOSA: For our mains, we went with the Mixed Grill (half) and some Fattoush. The fattoush might have been a bad idea. Way too acidic for me, but that’s a personal thing and not on Las Gidi Express. FOLLY: The Fattoush was also my mistake cause I meant to order Tabbouleh. I also agree with Nosa on how unneccesarily acidic it was. I've never had this experience at Syrian Club though, so I don't know if it's me or Las Gidi Express but there was something overly acidic about the dressing. NOSA: The Mixed Grill, however, was very lovely. The chicken was surprisingly flavorful. FOLLY: The chicken wings were soooo good and honestly, I was surprised. This is because depending on where you go, the mixed grill is sometimes odd cuts of dry meat that are only bearable after dipping in the garlic sauce. NOSA: As far as flavor is concerned, Lebanese food and Nigerian food are polar opposites. So more often than not, we (read: Nigerians) often get disappointed by their chicken. Not here though. The chicken in the mixed grill was the perfect middle ground. Both flavors coexisted in peace and harmony. FOLLY: A solid mixed grill platter for a decent price. Considering that Nosa and I shared the small platter, I'm inclined to say this is great value for money. FOLLY: Las Gidi Express was pretty good, but Syrian Club is undefeated. I rarely ever crave Lebanese food but if I do I'd go back here. The entire Goodies parking lot is available.